First of all, turn the system off immediately. This is usually the worst of the six different sounds. One cause for this sound is that the blower wheel came loose from the motor shaft, moved and is hitting the blower housing. In this case, if no damage was done to the wheel or the motor shaft, it could be moved back to the proper spot and re-tightened to the motor. Another and more likely cause is that the blower wheel actually broke, in which case it would need to be replaced. This makes a very disturbing sound almost as bad as fingernails on a chalk board. A third possibility is that a motor mount broke, causing the entire motor and blower assembly to drop and the blower wheel is hitting the housing. In any case, please shut off the system ASAP when this sound is heard or the repair bill could significantly increase. Sometimes this sounds like an out of balance washing machine. This is usually a blower wheel out of balance. Sometimes the motor itself can become out of balance as well. The sound isn't usually too bad but shouldn't be ignored because it can cause other problems to the system. If the unit is working fine then most likely it is just a noisy transformer. Some transformers are louder than others and they all hum to some degree. 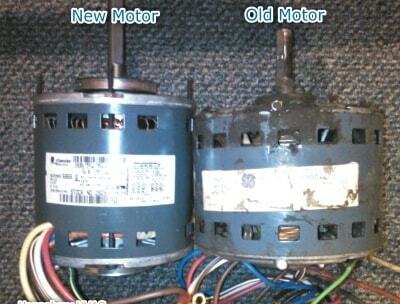 If the unit is not working and a hum can be heard, it could be a bad indoor fan motor and/or capacitor. This applies mostly to Heat Pumps. This is usually refrigerant-flow related, such as a check valve, and it's not always a problem. Some units have noisy check valves or metering devices. If the sound gets louder or annoying and the air filter has been checked, then a service call should be placed. This usually happens when the system fan first starts and/or stops. 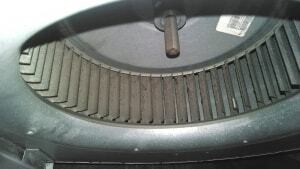 This is also only found on systems with sheet metal ductwork, and it is usually from the return trunk. When the fan first starts the duct pops in from the negative pressure of the fan. When the fan shuts off, the pressure releases and the duct pops-out . This could be a sign of undersized duct, a clogged filter, closed vents or flimsy duct; requiring bracing. Very Important: If you hear an unusual rumbling sound associated with combustion from your gas or oil-fired appliance, call for service immediately. This indicates what could be a serious problem with the burner portion of your appliance. Turn off equipment if necessary.